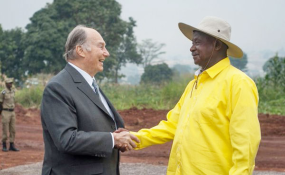 Aga Khan with President Museveni in Kampala. "His Highness the Agha Khan has done a lot of things for Uganda but also Kampala. Am sure you are aware that there's actually the construction of the Aga Khan hospital and training centre here in Kampala. The things that Aga Khan is doing depict him as having made huge community contributions", Kauju added.